Welcome back to Enuffa.com's History of WWE King of the Ring! Yeesh, what a downturn this show took from the previous year. Where the 1993 tournament carried real weight and accounted for the two longest and best matches of the PPV, this time the company skimmed through the tournament (allotting only 8.5 minutes to the LONGEST tourney bout), and inexplicably put a one-off Roddy Piper vs. Jerry Lawler match in the main event. Not to mention football player Art Donovan was part of the announce team, and knew exactly zilch about wrestling. Thus his commentary was laughable at best and distractingly nonsensical at worst. Of the three non-tournament matches only one was worth seeing, and despite being the billed main event it took place in the middle of the show. WWF Champion Bret Hart defended against Intercontinental Champion Diesel, in a shockingly good bout. 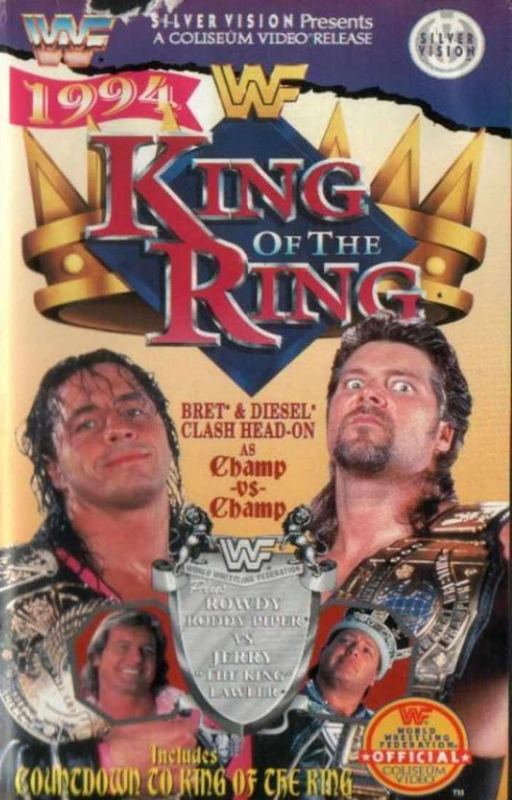 Diesel was a very unproven monster heel at this point but he had excellent chemistry with Bret as it turned out, and this was a fine 22-minute main event. 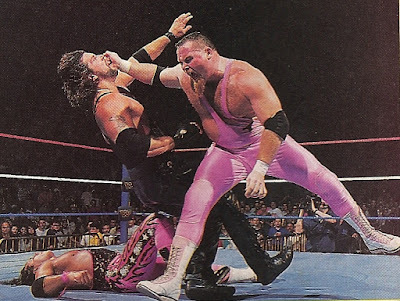 Diesel won by disqualification when Bret's old partner Jim Neidhart attacked Diesel, hoping to negate the unfair advantage caused by Shawn Michaels' interference. The second non-tourney match was for the Tag Titles, as The Headshrinkers defended against Yokozuna and Crush. I'd hoped for the heel tandem to win the straps here, as they would've made a dominant pairing. But a distraction by Lex Luger cost them the match, and Crush & Yoko would never team again. For some bizarre reason the main event slot went to the aforementioned Roddy Piper vs. Jerry Lawler debacle. This amounted to twelve-plus minutes of nondescript brawling leading mercifully to a Piper win. In what universe this could be considered a fitting main event I have no idea. Now let us never speak of it again. The tournament took up seven of the ten matches on the card, and despite some intriguing pairings nothing really stood out given the abbreviated length. The one memorable match in the tourney was the Owen Hart vs. 1-2-3 Kid semifinal, which was about as good as any 3.5-minute bout I've ever seen. They crammed a ton of action into such a short time. Still though, it was only 217 seconds, so it could only be so good. The Owen vs. Razor final could've easily been a 4-star affair had it gone 15-20 minutes, but the company only gave them six and a half. I dunno about you, but for me a guy winning the final of a tournament in such short order when said tourney is meant to elevate him kinda negates the importance of it all. Owen won the tournament in part thanks to Jim Neidhart, who revealed himself to be in cahoots with Owen the entire time, having preserved Bret's Championship for the eventual Bret-Owen rematch. Still the crown went to an eminently deserving new heel who was now the top antagonist in the company, setting the stage for SummerSlam. How was this match not epic? This was a one-and-a-half match show. There's no other way to describe it. The WWF Title match was great, and the Owen-Kid semi was a spectacular short match. Otherwise this show stunk to high heaven. What I'd Change: Skip the Piper-Lawler nonsense, leave Art Donovan at home, and give the tournament matches a feeling of actual importance. Owen vs. Razor only being allotted 6:35 is inexcusable.